The story behind the myth of two beloved Sierra classics. Back in the late '80s - early '90s when adventure games reigned supreme, Sierra On-Line was the ultimate household name. During the steady stream of Quest and Larry games that established their legacy, a couple of less-known but no less-loved titles came along: Conquests of Camelot and Conquests of the Longbow. Not unlike the mythical tales that inspired them, they both established themselves as classics that rigorously withstood the test of time, thanks to their meticulous craftsmanship and irresistible charm. Tell us a little bit about yourself and how you came to design two adventure games that are still considered to be on par with the classics from this golden era. Christy Marx: I began my writing career by writing for Marvel Comics (Conan, Red Sonja, my own series The Sisterhood of Steel), and for animation (Spider-Man and His Amazing Friends, G.I. Joe, Jem and the Holograms, and many others). Late in 1988, a headhunter called our house looking for artists to work at Sierra On-Line. At the time, I was married to Peter Ledger, an Australian illustrator, painter, and comics artist. Somehow they'd gotten Peter's name and number. I think Sierra had a hard time finding artists that wanted to move into the obscure mountain town of Oakhurst where they were located. I've always been quick to jump on new opportunities and a chance to learn a new form of writing. I asked whether Sierra would be interested in a writer/artist team? They were very interested, especially when they learned of my scriptwriting background. Peter and I drove up to Oakhurst, met with Ken and Roberta, and made a deal on the spot to move up there and work for them. That was the nice thing about Sierra at the time -- if Ken and Roberta decided they wanted to make a deal like that, they could make it happen instantly. I knew nothing about making computer games, so the first couple of months mainly consisted of me playing every Sierra game, and talking to the programmers, artists, and other designers about what we could and couldn't do with the existing technology. A lot of research seems to have been put into your games. What was it about these two legendary tales that motivated you to turn them into adventure games? If you were to make this into a trilogy, where would the story go next? Christy: During our initial interview with Ken and Roberta, one of the key questions I asked was "If we create an original IP for you, do we have any ownership?" They said, no, they would want full ownership. I wasn't willing to create a new, original IP without some ownership, so they put forward the idea of doing a King Arthur game. "I began doing extensive research, buying books, reading up on how the stories of a "King Arthur" began and developed across the centuries." I love all forms of mythology and legends, and so did Peter. We agreed that was an excellent solution. I began doing extensive research, buying books, reading up on how the stories of a "King Arthur" began and developed across the centuries. 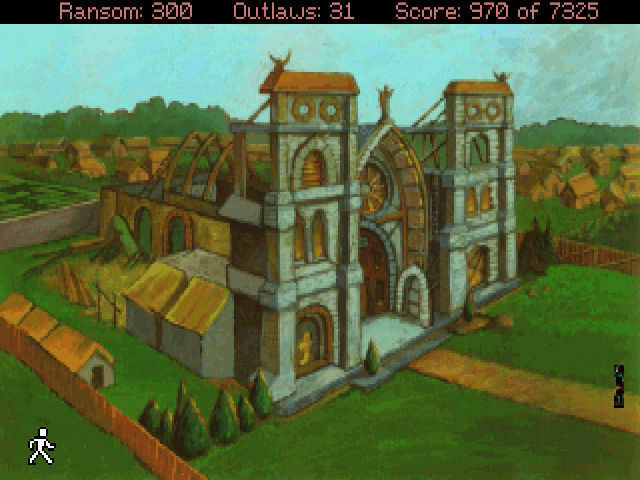 I used real locations and interesting artifacts that I came across, such as the Chalice Well and Glastonbury Tor, which had associations with Arthur. When I decided to expand the game to include Jerusalem, I consulted a friend who grew up there and learned about other cool places I could include, such as the Pool of Siloam. For the second game, I originally intended to make a game based on Greek mythology, focusing on the goddesses. During that time, about three or four Robin Hood movie projects were announced. Roberta began dropping hints that they'd love to put out a Robin Hood game. I was perfectly happy to go along with that, given my love of archery and Robin Hood. My research process was the same as before: I bought lots of books, studied how Robin Hood had begun as a trickster character in ballads and then acquired additions to the lore over time, such as Maid Marian and King Richard. I contacted the history museum at Nottingham and purchased materials from them. As before, I discovered and incorporated the cool things I came across such as the ancient pub (which is still there) and the sandstone tunnels beneath Nottingham Castle. 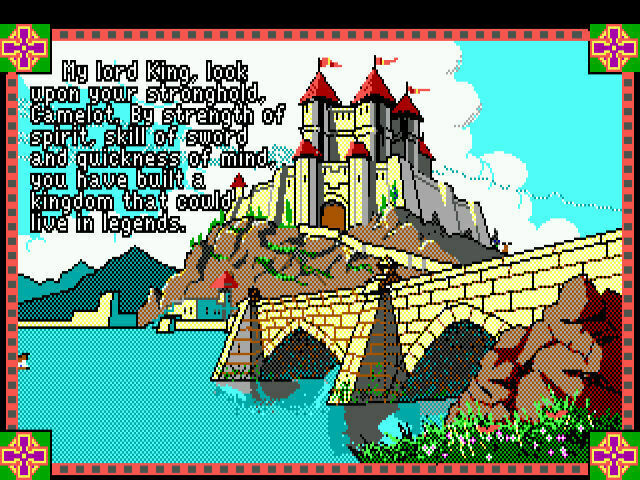 Had I remained at Sierra, the direction I was thinking about for a third game was Conquests of Charlemagne. He would have fit nicely into the theme of the games. Did you ever consider Kickstarting the sequel to your Conquests games or were you ever approached to that end? How would you want it to look like? Christy: I've had many people ask me for that, but I don't think they understand how much work goes into one of these games. It's a massive undertaking. Each of the Sierra games took a year and a half of my life, and that was with Sierra providing everything I needed -- a team of professionals, equipment, game engine, production, technical support, QA, distribution, sales -- there's so much that goes into it. I don't have the time or energy to put all of that together myself. I would love to make another one, if I could find a similar situation where that support was provided. I'd make it retro as far as the style of gameplay very much along the same lines as Camelot and Longbow, but would update the art and sound. What were the main reasons why adventure games were so massively successful in the early days of the medium and why have they been relegated to a mostly niche status today? Christy: Those were the early days of games. Everything was new, experimental, without established categories and the type of specialization we have today. Even being a designer wasn't a role set in stone. There were no rules, no laws, for being a designer. We made the games we liked to play, and most people who used computers at the time happened to like them as much as we did. We were on the creative edge with technology advancing in leaps from game to game. Remember that Camelot was a parser-based game while Robin Hood took the leap to a point & click game because the mouse became a significant part of using computers. Doing art for Camelot drove Peter crazy because he could only use sixteen colors, some of those achieved by being dithered. With Robin Hood, we had a full 256 colors! Woo hoo! Plus they were DOS-based, and DOS kept evolving into Windows and so on. But once games got beyond most of the big platform and technology differences, they began to splinter into different categories. One type of game would become hot and everybody would want to do that, then another type of game would hit big and everybody would jump on that bandwagon. "That was one of Sierra's mistakes, in my opinion. They stopped innovating and began following trends"
That was one of Sierra's mistakes, in my opinion. They stopped innovating and began following trends. Somewhere along the way, the audience of games shifted and became more male-oriented. I think this had a large negative impact overall, as it pushed games into more rigid paths, until mobile games came along. Now suddenly we see a huge influx in women playing mobile games, even when they don't consider themselves "gamers". Unfortunately, mobile isn't a good platform for adventure-style games. The trick is to make players of all persuasions aware of the variety of great games they can play, including those with adventure-style gameplay. What gaming projects are you working on at the moment? Should we expect you to write and design another adventure game in the foreseeable future? Christy: I spent the last six years as a Narrative Designer at Zynga learning about Facebook games, then working on mobile games. I've just left Zynga, so I'm wide open to new possibilities. I would love to do meatier, more challenging Narrative Design and game writing than I was able to do on mobile.